Water damage can occur in commercial or residential properties in Central Mississippi due to the frequent rainfall, with everything from leaking ceilings to home floods occurring in the area. When moisture sits on the surfaces of a property for an extended period, it can cause structural damage and mold growth. To curb this destruction, the repair techs at 911 Restoration of Jackson make themselves available 24/7/365 and guarantee to arrive within 45 minutes to implement same-day, water damage restoration services. This immediate assistance means that whenever you need flood cleanup services, technicians will be there to help, no matter if your water disaster occurs during the day or late at night. On top of our promptness, the professionals want you to know that you can trust us with your home or business because we work with IICRC certified technicians and the entire organization is licensed, bonded, and insured. If you live in Jackson, Pearl, Madison, or anywhere else in Central Mississippi, call the experts at 911 Restoration when you need emergency storm repairs and water extraction services. Let us provide you with the peace of mind you deserve. Trust is essential to 911 Restoration of Central Mississippi. The staff wants customers to be confident in the abilities of our technicians, and to achieve that trust we need to prove to you that we are the most qualified company at implementing water damage restoration. 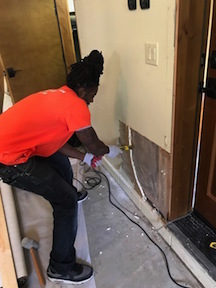 The Jackson branch is locally owned and operated, making the technicians we employ keenly aware of the specific water removal services that property owners in Central Mississippi need to recover from a water disaster fully. We enter each situation by first providing the property owner with a free visual inspection, allowing us to determine the damages and strategize a water damage restoration plan. Whether we are called to fix a water leak in the ceiling or mitigate house flooding issues, you can trust that the technicians are capable of helping you overcome any circumstance. If you need help from a flood cleanup company that will take care of you, then call 911 Restoration of Central Mississippi, and the technicians will get your property dry and clean again in no time. With water damage comes the growth of micro-organisms that can create mildew on carpets and upholstery, or cause a mold colony to start growing behind your sheetrock. Mold thrives in humidity and moisture, two elements that make up the long, hot summers in Jackson. 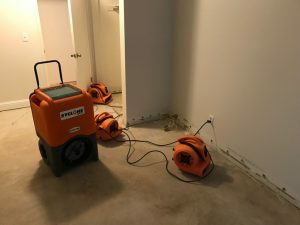 For these reasons, the repair workers always administer free mold inspections when they are called to water removal jobs. House flooding issues need to be carried out correctly to secure the property from experiencing further damages, such as wood rot and mold growth. So, customers can be sure that our team will always issue comprehensive water damage restoration services. The repair unit uses the most sophisticated equipment to-date that guarantees your property will be completely dry and free of all signs of mold and water damage. For example, water can find itself in the most remote spots of the home. Therefore we utilize infrared cameras to locate humidity behind walls or underneath floors. By drying the space with air movers and dehumidifiers, we can lower the humidity levels and create an inhospitable environment for mold. Technicians will also test and evaluate the structural integrity of the property. When you need the most effective mold, leak, and flood cleanup services in the industry, call 911 Restoration of Central Mississippi today, and soon you will be on the road to a Fresh Start.